Download the The Dorn Method e-Book today! The first book written about The Dorn Method in English by Thomas Zudrell, a top German Dorn Method trainer. 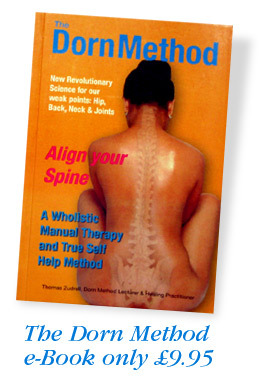 This new and first book in English about The Dorn Method is written as a True Self Help Manual for people who suffer from Back Pain and want to know why they do so and what they can do to get relief. It provides new and easy to understand insights into a very common ailment, and offers a proven method to finally overcome a problem that conventional medicine and even many other 'alternative' approaches could not solve until now. The Dorn Method eBook addresses quite a complex subject in a simple to understand manner, providing many photographs showing how anyone can apply the principles of this revolutionary and exciting new therapy. The Dorn Method Self Help Exercises also featured in this book are actually designed to partly replace the adjustments done by a Dorn Method Therapist, and can be safely applied even without a prior therapy, although of course it is always best to receive a treatment first and use the exercises to maintain the success of the therapy for long term results. Finally, the book also features many photos showing what we do wrong in our every day lives and what we can do right to avoid future and current possible health problems brought about by potentially harmful movements, sitting positions and lifting habits etc. If you want a good insight and introduction into The Dorn Method, then this e-Book is a great low cost way to learn all about this exciting and revolutionary technique which is changing the face of back care all over the world. The cost of the eBook is only £9.95. To order, please click on the Order Now button below where you will be directed to PayPal to place your order. Once you've ordered, you will be redirected to a page where you can download your e-Book immediately. Please note the eBook is a (5MB) pdf file and you will need Adobe Reader to be able to read the ebook. If you have not got Adobe Reader installed on your computer, don't worry, I've included a link for you to download and install it.